Providing you the best range of higro submersible water pump 2000 lph, higro submersible water pump 2500 lph, higro submersible water pump 4500 lph, higro submersible water pump 3500 lph and submersible water pump 5500 lph with effective & timely delivery. We are remarkable enterprise, the instrument in offering superior quality Higro Submersible Water Pump 2000 lph to our clients. We are engaged in offering the finest quality Higro Submersible Water Pump 2500 lph to our clients. We provide HiGro Submersible Water Pump 4500 lph to our clients. We are engaged in offering a quality approved the range of Higro Submersible Water Pump 3500 lph to our clients. Submersible Water Pump 5500 lph has a high-strength wear-resistant shaft core, coupled with a highly efficient energy savings motor, that imparts a long service life to the pump. The pump is waterproof, has a high dielectric strength, is safe and reliable. It is easy to clean and has best-suited designs for use in hydroponics systems. 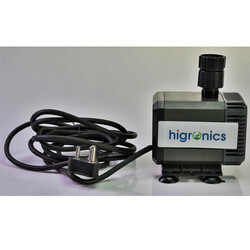 Looking for Higro Pump ?